The presentations that comprised the Asper Centre’s Constitutional Law Symposium panel titled “Seminal Cases for Past Reflection and Future Consideration” featured Ben Berger, Associate Dean and Associate Professor, Osgoode Hall Law School; Richard Moon, Professor, University of Windsor, Faculty of Law; and Margot Young, Professor, University of British Columbia, Allard School of Law. The panel was moderated by Breese Davies, the Asper Centre’s current Constitutional Litigator-in-Residence. The presentations all concerned the development of Charter rights jurisprudence in Canada. The introduction of the Charter in 1982 challenged the Supreme Court of Canada (SCC) to adapt to its role as interpreter of Charter rights and integrate them into the existing constitutional body and Canadian society. Each panelist discussed an instance of this process and a perspective it offers on the development and future of Canadian constitutional jurisprudence. Professor Berger’s presentation, based on his paper entitled “Assessing Adler: The Weight of Constitutional History and the Future of Religious Freedom” considered the seminal case of Adler v Ontario (AG) within the broader context of Canadian constitutional logic and subsequent freedom of religion jurisprudence. Adler was an SCC decision that upheld the constitutionality of selective public funding for Catholic and denominational schools to the exclusion of Jewish schools. The SCC held that s. 93 of the British North America Act, which mandated the existing funding scheme, had constitutional status and was therefore immune from the s. 15 Charter challenge advanced in the case. The SCC emphasized the historical importance of s. 93 to federation in its reasoning in Adler. For Professor Berger, this exemplifies what he calls the particular logic of Canadian constitutionalism, which preserves past constitutional compromises and defers to them in addressing contemporary concerns. This he contrasts with universal logic, which consists of faith in reason of legal principle and demonstrates a distancing from past arrangements or the status quo in reasoning about contemporary issues. This universal logic values past constitutional arrangements to the extent that they are upheld by legal principles. The particular logic, by contrast, is not so limited in its evaluation. Adler anticipated the key role that education would play in the relationship between law and religion in subsequent Canadian jurisprudence. The reasoning in Adler foreshadowed an increased judicial awareness of the communal or collective element in religion when contemplating religious freedom. This development is evident in Loyola v Quebec, which constitutes the Supreme Court’s most ambitious statement so far regarding collective interest in the context of religion. Professor Moon, in his presentation titled “Dolphin Delivery and the Court’s Loss of Confidence” discussed how the SCC’s interpretation and application of Charter rights developed. When the Charter became active in 1982, there were high expectations that the courts would adopt a wide interpretation of rights. This was true at first, but the SCC gradually began to understand that this involved the courts in complicated political and social questions. Liberal interpretation of rights granted the courts a concerning power to reconstruct and reform the rights they were interpreting. The Dolphin Delivery case exemplified the SCC’s retreat from this mode of jurisprudence. In Dolphin Delivery, a court injunction on employees picketing outside a business was challenged on the basis of s. 2(b) infringement. The court injunction was issued because the common law banned the kind of picketing the employees sought to do. The SCC held that the Charter applies to state action, including the common law, but does not apply to private litigation divorced from government action. This limited the range of applicable rights-based claims. The SCC applied the s. 1 proportionality test and held that the picketing caused sufficient harm to the target business to justify the injunction’s infringement on s. 2(b). Professor Moon observed a tendency in SCC’s reasoning when it applies the s. 1 proportionality test that demonstrates two distinct understandings of the individual and their rights. The first step of the test is to understand the value of the right in question. Here, the SCC adopts a noble view of the individual and bestows intrinsic value on rights, such as the values of self-fulfillment, pursuit of truth, and democracy. The second step considers the infringing law in question and gauges whether the problems it addresses justifies infringing the implicated right. Here, the SCC adopts a behavioral view of the individual and a pragmatic understanding of rights. Rights first granted near-absolute value are then reduced to flexible treatment and subordinated to policy considerations that invariably and necessarily fail to contemplate all the relevant factors or protections that exist against the harm in question. The ordering of these two conflicting treatments is relevant to the outcome and facilitates findings that justify infringement. The final panelist in this session was Professor Young, who based on her forthcoming paper entitled “Equality at Large: Section 15 and the rest of the Charter” discussed how equality rights can be and have been interpreted in a manner that fundamentally changes how rights operate. Rights traditionally operate to insulate the individual from abuses of state power. They limit state interference in private life. But some s. 15 Charter arguments take the opposite approach. They justify state interference in private life. The state can impose social norms under the guise of protecting equality rights. The shield becomes the sword. And that sword can then be used to infringe other rights. The ongoing Trinity Western University case exemplifies the complicated challenge equality claims present when in conflict with other rights. Trinity Western University wished to open a law school with students and staff that willingly sign a community covenant promising to abstain from lifestyles deemed immoral from their particular Christian worldview. This includes abstaining from homosexual behavior. The Ontario and British Columbia bar refused to license Trinity Western University law school graduates on the basis that the school was discriminatory. Trinity Western claims this infringes their freedom of religion. The Trinity Western University case poses a question: Should communities composed of willing participants be free to collectively repudiate particular lifestyles and exclude persons living such lifestyles from their community? The alternative is state enforced indiscriminate integration and punitive noncompliance measures. This is of course a matter of degree and context. Professor Young argued that the space in which such conflicts occur must inform the decision. For example, Trinity Western is a private law school, but its program qualifies graduates for a law license, a public resource. These qualities define the space being considered. If it were instead a private business school, considerations should account for and reflect the differences in these cases. Isolating rights conflicts from the space in which they occur neglects their complexity and condemns the debate to a principle standoff. 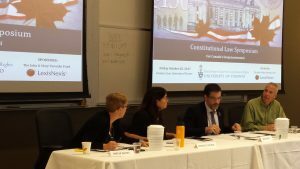 Taken together, the panelists’ presentations suggested the SCC’s adaptation to the Charter exemplifies a balance of liberal and conservative concerns. Professor Young identified the potential for s. 15 equality rights to reform our Canadian constitutional law. Yet, Adler demonstrated the SCC’s concern to insulate the existing constitutional body from s. 15 based claims for reform, while Dolphin Delivery too limited Charter claims to instances of government action, denying their applicability to private litigation. Upcoming cases like Trinity Western University will inform how this process will continue into the future.